Michael McFadyen's Scuba Diving - Black Rock Chimneys Black Rock is a very prominent landmark on the western side of Rarotonga, the main island of the Cook Islands. These rocks are (as far as I can see) the only major outcrop of rocks on the shore's edge of the whole 34 kilometres of the island's circumference. For most of the island, the fringing coral reef comes close to the shore, like it does off Black Rocks. The rocks give their name to the small village (locality?) and some villas. They are just north of the Edgewater Resort and south of the western end of the runway. This site is about eight minutes from Avatui Harbour. The anchoring spot is 30 to 50 metres off the fringing reef. The GPS reading for this site is a latitude of 21° 12.315' S and longitude of 159° 49.530' W. Note that this GPS Reading was taken using WGS84 as the map datum. See my GPS Page for more details. This site consists of a series of ridges and gullies. The depth at the anchoring spot is above seven metres and there is a gully right next to it is about 12 metres. As you go west the reef drops gradually to 25 metres. surface. The coral here is not very good. I estimated that there was only about 15% live coral. I also saw no sponges at all and not even a tiny gorgonia (let alone a huge one like seen in many South Pacific Ocean countries). There were some blue, yellow and pink Christmas tree worms in the coral, one of only a few locations that we saw them. There were a few giant clams, although not too huge. Fishlife was also sparce. 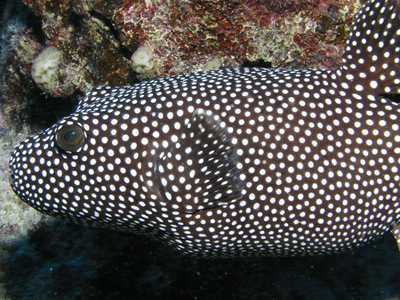 We saw two barracudas and a few bluefin trevally as well as a nice Guineafowl puffer. 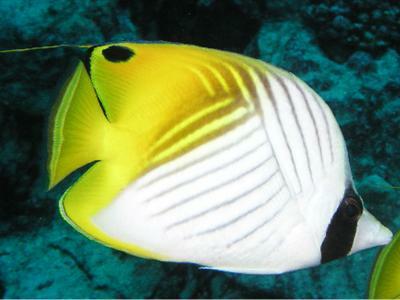 There were a few surgeonfish and trevally, some different butterflyfish (threadfin, longnose) and a few Moorish idols. That is about it except for heaps of black sea cucumbers.